"Since many of our daily activities are improvement based and yang oriented, our yoga and meditation practices need to have a strong yin element for us to heal this culturally ingrained imbalance." ~ Sarah Powers, author of Insight Yoga. As I get older, I am becoming more and more fond of all things Yin. If I had known in my 30's what I know now in my 50's, I would have been much healthier in all things, of my mind, body and soul! 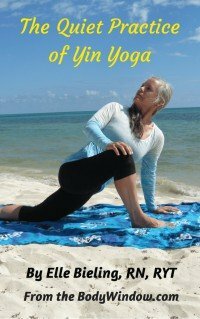 If you are unfamiliar with the concept of Yin Yoga, you may read my article, "What is Yin Yoga?" to help you catch up as well! By learning this mindfulness practice, you will be able to bring to your activity-filled life the balance that it desperately needs! Come to a sitting position with your legs extended in front of you in the Staff Pose. Place your hands just behind your hips and lean back on them, as you bend your left leg. Your left foot should be towards your left hand as shown in the first picture below. Assess your left knee. If you cannot get into this position OR if the pain in your left knee is more than mild, do not do this pose. Do the Sphinx Pose instead. If your left knee pain is only mild, you may try rolling up a small towel and place it just behind your knee. If the pain subsides with this modification, go ahead and proceed with the next step of the pose. You should not do this pose if you have spinal injuries or disc problems. If you are able to breathe deeply and calmly, without grunting or grimacing, lower your torso so that you are resting on your elbows, in the halfway position, below. Re-assess your left knee. Is it OK? If not, do not do this pose. Also assess your quadriceps at the front of your left thigh and your left hip flexor in the front of your pelvis. You may begin to feel a nice tugging here. Keep breathing slowly and evenly. If you are at a mild edge here, stay here for several breaths and see if your quads and hip relax and open. If they do not, this is your pose for the time being. Notice your tendency to push too hard, or judge your inability to go farther. Remember that all mindfulness practices never judge or condemn, but only notice with curiosity. Mindfulness does NOT mean that you abandon your intent to go deeper, but to be content with yourself and your body wherever it lands. It is OK to intend to keep improving. This only happens when you learn to relax and release, not though pushing and judging! What a beautiful life metaphor, don't you think? Hold this halfway position for 3-5 minutes, continuing to breath deeply. If you have not reached an edge, and feel you can open more, proceed to the lying down position. Re-assess your left knee, left quads, left hip and now your lower back. Keep breathing. If there is more than mild discomfort, go back up to the halfway position and hold it for the 3-5 minutes. If you are at a mild edge, continue to hold this full pose for 3-5 minutes. The secret to all the Saddle Poses is to stay as totally relaxed as possible. You can only achieve this deep relaxation by utilizing your best internal methods of belly breathing or ujjayi breathing. The key to your best relaxation method is through staying conscious of the breath at all times. When you learn to practice the mindfulness of attending to your breath, sending new energy and relaxation into the area that is being tugged upon, through the breath, these poses will become effortless. This is the key to a mindful, Yin practice. It is a meditative practice that will change your life! That is because these internal methods will spill over into your everyday actions, slowing your reactive tendencies and bringing you more calmness into your body, your mind and your soul. Now repeat the Half-Saddle on the right side. You may be surprised that the other side is quite a bit more open, OR more closed than the left. Just notice this with curiosity, not judgement. Play with your edges on this side, and hold the pose for another 3-5 minutes. The full Saddle Pose approximates the Yang version called the Reclining Hero pose. However it has a different name because the intent of working deeper into the joints differs as well as how you actually set up the pose. You keep your feet under your buttocks throughout the pose and allow the knees to widen, so the opening is in the joints rather than in the muscles. Come to a seated position, sitting on your feet as shown below, with your knees slightly apart. If you were able to do the Half-Saddle, but are not able to do this starting position, keep on working on opening more in the Half-Saddle before returning to the Full Saddle. While continuing with your conscious breath, proceed to the next step and attempt to lie back on your elbows. Assess your quadriceps, your hip flexors, and your lower back. If you can continue to breath slowly and calmly, stay here for a few more breaths. When you are ready, if your edge is not intense, release down to the full lying Saddle Pose. Remember that it is more therapeutic to hold a pose longer, at a milder edge, than to only hold the pose at full intensity for a few moments! If your edge is too intense after a few breaths, you need to come back up to a milder position that you can hold. This is an extremely edgy pose, so please go slowly! You may also try to lie back onto a bolster or cushion to relax into the pose at a lesser intensity. Try placing the cushion on your shoulders only first. This allows you to invite your lower back to continue to open. If this is too edgy, go ahead and place the bolster lengthwise under your lower back as well. As you can see in the above photo, this is not one of my best poses. Some days I do better than others, but as always, the mindfulness practice itself is where my intent lies, not in the perfection of the pose. It is in exploring the possibilities for relaxation and opening to what is and what could be! But perhaps the most important therapeutic effect of the yin poses, is that they provide self-acupressure to the meridians, to unblock the flow of energy or Qi, according to the Chinese medicine system. In the case of the Saddle Poses, the Kidney Meridian is stimulated. The Kidney organ is responsible for regulating the emotions surrounding anger and the ability to change. Its key element is water, and this organ represents the ability to flow with life's changes. Don't be surprised, if your mindfulness applied to this pose, brings up strong feelings in you, of anger toward yourself and what is going on in your life. If it does, just notice this. Sit with the emotion, without doing anything about it. Stay present and aware. Notice if the emotion changes or not. The goal of all meditative practices is for insight! Staying self-aware and present to what is arising in you, is the precursor to insight, and nothing teaches you this better, than practicing Yin Yoga in a mindful fashion! If you would like individual coaching, regarding how to better apply mindfulness practices to your yoga practice, I am here to help! Just click on my information page, at Holistic Health Coach, and you will find a description of my services. May you always be present to what is in your heart and your life, when you practice the Saddle Poses. May you open your heart, your body and your soul and find healing in all things!